With the Model 588, we have packaged the precision pulse and digital delay timing designs in a convenient package for embedded and OEM applications. 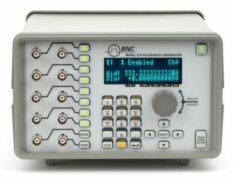 The new Model 588 1U DDG gives users 8 channels of precision timing in a package designed for remote applications and large system gating/synchronizing. Our precision clock and many channel features compliment the low-profile packaging to give system integrators a refined rack-mount alternative to multiple boxes and cables cobbled together around a test setup. When it comes to custom timing requirements, our applications team is available to address your most demanding needs. 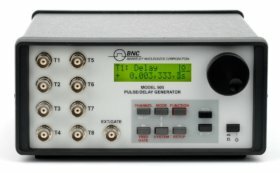 The Model 588 Digital Delay / Pulse Generator represents the latest in timing and synchronizing capabilities. With a unique 19” 1U form factor, the Model 588 is clearly our most innovative instrument to accurately synchronize any series of events. The 588’s eight independent outputs, dual trigger/ gate inputs and external clock reference input make it ideal for laser system timing applications. The system can directly phase lock to an external timebase up to 100MHz in frequency and down to 20mV in amplitude. This allows synching directly to a laser photodiode signal and provides complete system timing relative to the laser timing with low jitter. The 588 also provides a Clock Output that is capable of driving a 50 Ohm load and can be used to provide a master timebase to other delay generators or equipment. The core technology in precision timing of the 588 offers 250pS Delay & Width resolution and 50pS internal jitter. 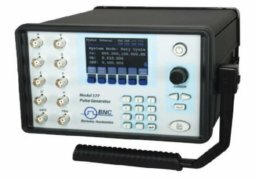 Ethernet / USB interface, complex burst sequences, Divide-by-N, Setting Profiles, Dual Triggers, Dual Gating, Clock Divider, Pulse Picking and Negative Delays allow users great confidence in setting up an experiment or synchronizing multiple events. Complimentary NI certified LabVIEWtm drivers available. 588-1U-4C - 4-ch, Delay/Pulse Generator, 1U 19"
588-1U-8C - 8-ch, Delay/Pulse Generator, 1U 19"
588-1U-4C 4-ch, Delay/Pulse Generator, 1U 19"
588-1U-8C 8-ch, Delay/Pulse Generator, 1U 19"